Symphonic metal, melodic death metal, and the country of Sweden are 3 distinct things that happen to remind me of my early metal listening years, and what originally got me into heavier metal, harsh vocals and so on. Because of that nostalgia, MEADOWS END from Sweden is a band that greatly interests me. They bring a really fresh and unique sound to the classic melodic death metal genre, tying in many power and symphonic metal influences, but with a ton of modern guitar chunk. It’s a fairly distinct combination, and in today’s MDM climate really packs a punch. 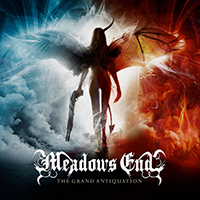 MEADOWS END is back with their 4th album since releasing their debut in 2010. They were active for years prior to that releasing demos, amid bouts of lineup instability, but since 2010 they’ve steadily built up to the point of releasing their latest effort, “The Grand Antiquation”. It marks a decided step forward, building upon the group’s previous work. Their work prior has been solid, but without garnering as much attention. “The Grand Antiquation” could certainly change that. It’s decidedly melodic death metal, but with massive and perfectly blended in symphonic overtones that permeate pretty much every single song. It’s at the point where you could argue they’re equally a symphonic band, but ultimately the MDM core is what defines them. Coupled with excellent production and a modern groove n’ chunk feel, it’s a fresh take on a classic metal genre. It’s old and it’s new at the same time, in a mostly delightful way. As much as I love melodic death metal, it is easy to let it go stale. And it has gone stale with a lot of bands in recent years, either failing to break out of the 2000s MDM sound, or leaving the sub-genre entirely for poppier sounds. MEADOWS END manages to avoid that entirely. It’s classic, fresh, heavy, and epic. In the beginning of the album, they open with one of their chunkier and more MDM focused tracks, “Devilution”. It’s a strong start, setting the MDM overtone to the album. Other tracks that fell in this similar feeling were “Her Last Sigh Goodbye”, maybe the most straightforward and classic MDM song on the album, and the closer “I Stilla Vemod Vandra”. That was possibly my favorite song on the album, with some of their best drums and melodic guitar work, particularly with the ending where the melodic guitars really shine. But it also has plenty of chunky bits, slower bits, and in typical closer fashion, builds over the course of these different sections from a slow opening to a grand finish. Aside from these three songs, which fall in at tracks 1, 6 and 9 respectively, we get lot more power metal influence in the middle of the album. Still rooted in the MDM sound, but with tons of power and symphonic influence driving the songs. You hear this particularly in “Storm Of Perdition”, which is much more slowed down and anthemic, “Svept I Sorgepläd”, which is blistering fast, and “Non-Dreaming Eye”, which was more proggy and chunky, especially in the middle section. Track 7 “The Insignificance of Man” stands out all on its own, as it is the only song to feature some clean vocals, which do work out nicely! This is a fantastic album that is worth your time. There’s enough legit MDM to keep classic fans happy, and it’s certainly heavy enough. But, there’s also still plenty of symphonic sounds and modern metal chunk to entice new fans and spread the MEADOWS END name onward. Fantastic work gentlemen, this is one I’m excited to keep listening to.